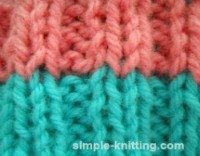 Simple little knitting tips and techniques can be so helpful as you learn how to knit. And by knowing a few tricks of the trade it can turn a so-so knitting project into a fun experience making it easier and quicker. It can even look better too. What I have done is created two pages of knitting tips, this one and a page on tips for knitting beginners. Rather than sifting through the tips on this page, I wanted a dedicated page for new knitters as well. 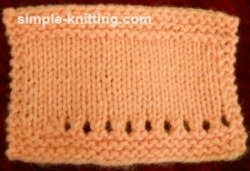 I wanted to give beginners some extra knitting help as you begin knitting your first few rows. How many of you have tried casting on a lot of stitches only to find that you ran out of yarn before you were done? And then the next time you tried you over compensated and had three extra feet of yarn left? haha Arrgghh! Me too. But not anymore, check this out. Note: If you're a new knitter you will need to check out the original version of the long tail cast on too so that you have the full step-by-step instructions. Then you can come back here and see this terrific tip for knitting the long tail. Don't worry I'll wait for you. All you are going to do is use two balls of yarn or one ball using both ends. Now tie both ends together into a slip knot. Then use both ends just like using one long end the other way. Note: When you are counting stitches make sure not to add the slip knot as a stitch. You won't be using it. When you have all the stitches you need, cut one yarn end so that now you are using just one ball of yarn. Now you can start knitting your row until you come to the slip knot and stop. Just undo the knot and carry on. Isn't that great? I sure like it, especially when I am casting on two or three hundred stitches. And there's no wasted yarn. You betcha it's really, really is the most important knitting tip. In fact it may not sound like a tip to you but I want you to know how much easier knitting will become when you learn and understand about knitting gauge. It truly is that important and honestly when you get into the habit it will become second nature. Really. Just make a row of eyelets for the size needle you used. This is the greatest little knitting tip and it's really easy to do. Have you ever noticed that when you change colors when ribbing stitches the little purl stitches poke through on the right side making it look....well kind of messy and not crisp and clean? You're going to love this! Well....I sure did. When you add a new color just knit the whole row with the new color and then continue on with your ribbing. Now it's nice and clean and crisp. Do you ever find that you bind off stitches too tightly? And do you find that the last stitch on the bind off row is really loose and messy? But I have ways to clean up that bind off row once and for all and I even made a page about it to help you too. Check out my bind off knitting tips page right here. 6. Knitting Cables Without a Cable Needle. Oh My..
Maybe, but when I discovered that there was a way to cable stitches without using the cable needle it was a total epiphany for me. Suddenly knitting cables wasn't so difficult anymore. You may feel the same way. 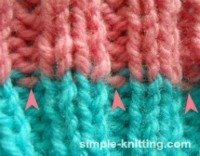 Have a look and see how to knit cables without a cable needle. I'd love to know what you think. Do you ever notice holes on the sides of your knit cables? This simple increase has been around for little while now and I've included it on my increasing stitches page. But I think this is a great little knitting trick and warrants a spot on this page too. This knitting increase is similar to the KFB (knit front and back) however it's made so there's no bar in the front of your knitting. It's brilliant and so easy to do. Have a look. Everyone makes knitting mistakes. It's a fact of life and these simple knitting techniques will show you how to fix those mistakes with confidence. You'll be up and knitting in no time. Twisted Stitches What is a twisted stitch? I'll show you and you'll never have twisted stitches again. Dropped Stitches Did a stitch slip off your needle? Here's an easy fix.